They say that in life the only two things that are certain are death and taxes. Well, for the past 45 years, so was the Volkswagen Golf, the humble family car that has been an icon in its own right, and the continued success of which has inspired many imitators. 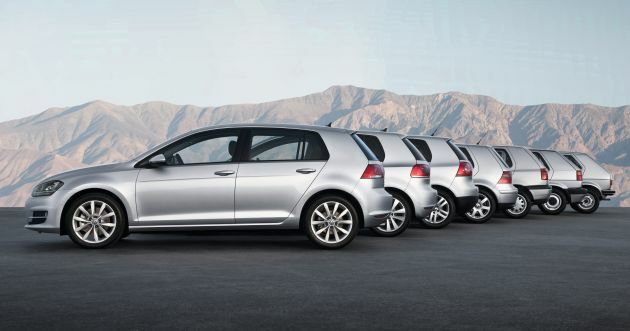 To date, over 35 million Golfs have been produced, making it the most successful European vehicle ever. To put that into perspective, that is an average of 780,000 vehicles sold each year, meaning that somewhere in the world, a Golf has been bought every 41 seconds, without interruption, since the start of production. 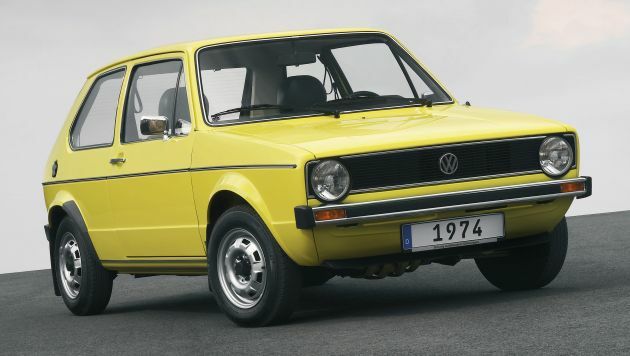 That was on March 29, 1974, when the first front-engined, water-cooled Golf rolled off the Wolfsburg production line to replace the rear-engined, air-cooled Beetle. Sporting sharp Giugiaro-penned lines, it was named not after the game or the Gulf Stream as originally thought, but a horse owned by then-Volkswagen head purchaser Hans-Joachim Zimmermann. It wore different names in other countries, including Rabbit in the United States and Caribe in Mexico, the latter being a Venezuelan term for a piranha. Since then, several variants have been produced, including cabriolet, Sportsvan MPV, electric e-Golf and plug-in hybrid GTE versions. There’s also been a number of memorable special editions over the years, including three built in collaboration with Pink Floyd, The Rolling Stones and Bon Jovi. These featured unique alloy wheels, special stickers on the rear flanks and even headrest embroidered with the bands’ names. The most famous variant is the GTI, which gets chassis upgrades and more powerful engines – up to 230 PS in the latest Mk7.5. Visual hallmarks include the golfball-like dimpled gearknob and tartan seat upholstery, both of which are the work of Volkswagen’s first female designer Gunhild Liljequist, who joined in 1962. But the crowning jewel of the lineup is the R, which pairs an even more powerful 290 PS engine with the security of all-wheel drive. 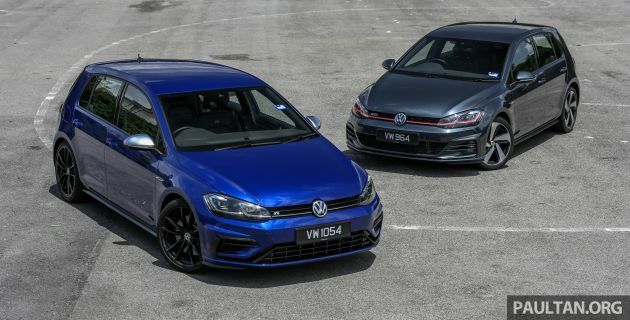 Both the GTI and R were skunkworks projects that were not originally meant for series production, until overwhelming public response changed their fates. The Golf is available in Malaysia in 1.4 TSI R-Line trim, priced at RM174,110 on-the-road without insurance. Equipped with the sportier R-Line appearance package, it is powered by a 1.4 litre TSI turbocharged engine producing 150 PS at 5,000 to 6,000 rpm and 250 Nm of torque from 1,500 to 3,500 rpm, sent to the front wheels through a seven-speed DSG dry dual-clutch transmission and an XDS differential lock. Forty-five years, seven generations and 35 million customers – quite an impressive set of numbers, then. Happy birthday, Golf, and here’s to several more years of success. Well, for past 35 years, so was our Proton Saga. If Proton was humble enough, today, we would have Proton Golf and Proton Tiguan. Two world renowned cars. VW was begging Proton to merge. But Proton was too arrogant. When Proton was strong 10 years ago, it could have married VW with equal standing. Equal power. No one party is stronger than the other. No one party has to kowtow to another. Equal standing in VW Group? You mean “equal standing” like how Skoda and SEAT are now a pitiful sub-brand doing rebadges? Or you mean “equal standing” like how Lamborghini was forced to “donate” their Gallardo for cheap rebadge by Audi as their R8? Or you mean “equal standing” like how Audi was forced to use cheap VW parts inside which cheapened their cars thereby losing traditional customers? If you are talking about those “equal standings”, then I will say Proton made the right choice to marry with Geely and stand equally rather than being a VW slave. Oh really? i didnt know that!! WOW! When one owns the other, there is no such thing as equal standings. If Nissan wanted to have equal standings then simply buy back those shares under Renault and make a clean break. What a waste. We could have had German cars as our Protons. Now we get China cars. I don’t see this problem with Honda in Malaysia. GLC are also involved with the Honda business but their cars are better specced on par with those in Japan (Hybrid, Honda Sense). Is this GLC fault or principal brand holder fault? yes joachim alias john, we bilip you! Only stupids who have nothing to say will insist to say anything including rubbish and if you insist to talk rubbish and make wild accusations, then it is your choice. It is also my choice to laugh at the lameness of your comment. Lolz! Gud one bro. He starting to think everyone is john, including his papa. Shud ask his papa john make him pizza instead. That will shut him up. Hahahaha! This from the same guy that thinks Triumph bike is related to the women’s underwear. How come lemon last that long? The kept replacing those lemons to keep them fresh. For 180k you can buy a brand new passat 2.0 with GTI engine and wet clutch also come with XDS. If we don’t mind of pre-reg can get a passat less than 5k km for about RM160k. Can’t believe if someone really paying RM174k for a Golf 1.4 MK 7.5. A performance street car but with electric parking brake. ..it is not as reliable as the venerable Saga. Happy Birthday Golf! Keep on the legacy!